(Nanowerk News) Flexible optoelectronic devices that can be produced roll-to-roll – much like newspapers are printed – are a highly promising path to cheaper devices such as solar cells and LED lighting panels. Scientists from the TREASORES project present prototype flexible solar cell modules as well as novel silver-based transparent electrodes that outperform currently used materials. In order to make solar energy widely affordable scientists and engineers all over the world are looking for low-cost production technologies. 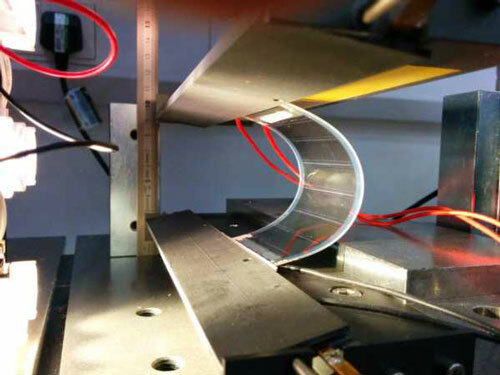 Flexible organic solar cells have a huge potential in this regard because they require only a minimum amount of (rather cheap) materials and can be manufactured in large quantities by roll-to-roll (R2R) processing. This requires, however, that the transparent electrodes, the barrier layers and even the entire devices be flexible. The EU-funded project "TREASORES" (Transparent Electrodes for Large Area Large Scale Production of Organic Optoelectronic Devices), which started in November 2012 with an overall budget of more than 14 Mio Euro and is led by Empa researcher Frank Nüesch, aims at developing and demonstrating technologies to facilitate R2R production of organic optoelectronic devices such as solar cells and LED lighting panels. The TREASORES project recently completed its mid-term review and has already achieved some major milestones. The international team that comprises researchers from 19 labs and companies from five European countries has, for instance, developed an ultra-thin transparent silver electrode that is cheaper than, and outperforms, currently used indium tin oxide (ITO) electrodes. The researchers could also demonstrate a record efficiency of 7 % for a perovskite-based solar cell using such novel transparent electrodes. What’s more, their first fully R2R-produced solar cells already achieved commercially acceptable lifetimes when tested 'in the field'. The next step, says Nüesch, is to scale up and improve the most promising technologies identified so far, say, to produce barrier materials and transparent electrodes in larger quantities, i.e. in rolls of more than 100 meters in length. In its second half, the TREASORES project will also continue to develop other promising technologies such as transparent and flexible electrodes based on woven fabrics, nanowires and carbon nanotubes (CNTs). "We are working on the most crucial issues in large-scale organic optoelectronics. Our new low-cost electrode substrates already outperform existing conductive oxide electrodes in many ways", says Nüesch. "But we must further improve the resulting device yields from large-scale production by reducing the defect density of the substrates." The new materials have been thoroughly tested using special instruments for mechanical, electrical, and optical testing and their performance in practical devices has been characterized e.g. for lifetime and quality of illumination. Silver nanowires were used to produce flexible electrodes with a sheet resistance of below 20 Ohms/square – a measure for the electrical conductivity of thin films – and an optical transmission of 80%. Copper nanowires were even better, yielding a sheet resistance of below 10 Ohms/square and an optical transmission of 90% on glass. They clearly outperformed current ITO electrodes, which typically have sheet resistance values of 100 Ohms/square and above for such high transparency. Solar cell devices with an energy conversion efficiency of over 3% have been made on these substrates with copper electrodes. CNT electrode performance likewise made significant progress during the first half of the project, reaching a sheet resistance of 74 Ohms/square with an optical transmission of 90%. 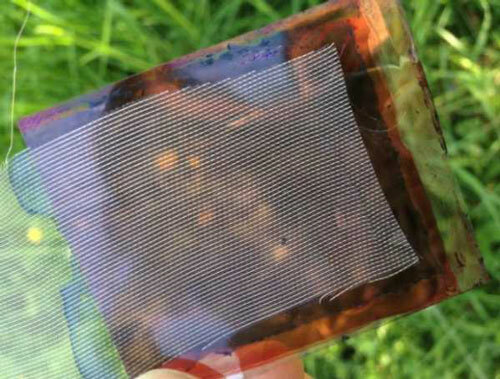 The organic solar cells that were produced with these electrodes reached an energy conversion efficiency of 4.5%. All these electrode technologies suffer, however, to some extent from waviness or roughness and require a flattening layer to allow defect-free deposition of optoelectronic device stacks. That’s why the researchers set out to develop yet another electrode technology, which uses thin silver (Ag) films sandwiched between two metal oxide (MO) layers. These films turned out to be much flatter. MO/Ag/MO electrode stacks provide a sheet resistance of 6 Ohms/square with an optical transmission of 85% and allowed the construction of more efficient optoelectronic devices compared to the other electrode technologies, which is due, at least in part, to the low peak-to-valley roughness of about 20 nm. With these 'ultra-flat' electrodes record efficiencies of up to 7% were obtained for organic solar cells using commercially available materials for light harvesting. Using the very same electrode materials, the team achieved 17 lm/W for the production of white light organic LEDs (OLEDs) and more than 20 lm/W for organic light-emitting electrochemical cells (OLECs). Although not quite record values for flexible OLED and OLEC devices, Nüesch stressed that "all electrodes were produced by an R2R process in an industrial environment or with industrially relevant processes on large areas of the polymer substrate. We can thus say that the processes we used are robust and reproducible."